The train rumbled to a stop at the American Fork Frontrunner station. I waited with the rest of the early morning commuters to make my way onto the bright shiny double-decker commuter cars. 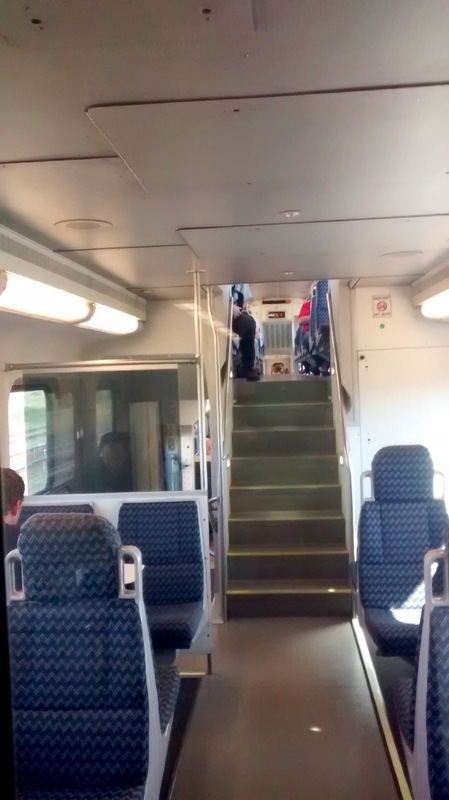 Even though American Fork is only the second stop on the Northbound line, most of the tables in the upper deck are typically claimed before I get on. “Table” is perhaps too strong a word. The surface is barely large enough to hold a laptop. With four seats facing it, even if I got a seat by one of the tables chances are there won’t be room for my iPad and wireless keyboard. 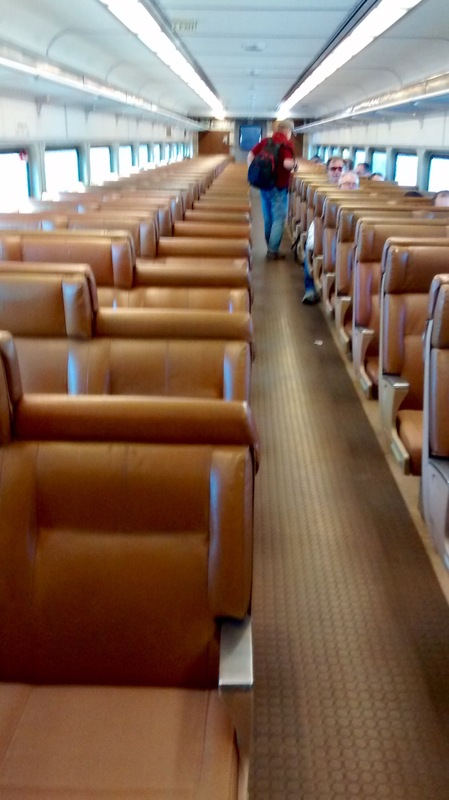 The seats are narrow and close to one another, nearly knee-to-knee with the person sitting across from you. As I step onto the train, I glance yet again at the strange car that sits just behind the engine at the North end of the train. Where the commuter cars are two levels, with large windows and lots of light, this car is a single level. It’s windows are small and too dark to see inside. I’ve always been curious what the car is used for. Was it for the train crew? Seems odd for a commuter train. Equipment? Maybe it’s a baggage car. Except, no one takes baggage on a commuter train. I’m tempted to go and look, but since the train only stops for a few minutes at each station, I’m worried,I’d miss the train while satisfying my curiousity. While I enjoy riding the train, a commuter train is crowded. Going to work there are plenty of seats at my stop. Although by the time we reach the Murray stop, where I get off, the train is nearly standing room only. The trip home, is worse. Murray is the first Southbound stop after the train leaves downtown Salt Lake City. It’s typically crowded. I can find a seat, but again, I’m cheek by jowl with my fellow passengers. A few days ago I decided to try something different. I noticed a line forming for the baggage car. The train always stops so that the doors are at the same location on the platform. Some office workers, clearly on their way home, were lined up waiting to board what I had been thinking of as the baggage car. What did I have to lose? If there was a problem getting on that car, the people in front of me would have to deal with it too. For once, “going along with the crowd” seemed like a good strategy. Whereas getting on the commuter cars was simply walking on, the baggage car had a set of steep steps followed by a seperate door at the top. The people in front of me dutifully climbed the three stairs, slip open the door and stepped back into an earlier time. The baggage car wasn’t actually a baggage car, of course. It was an old train car. The small windows showed the spider cracks from years of Utah’s unrelenting sun and desert wind. There was literally a luggage rack above the seats. And the seats themselves, instead of the pre-formed, squished, hard plastic of the commuter cars, were wide, soft, high-backed bench seats. Instead of knee-to-knee configurations, they were all facing the same way. And instead of being squeezed together with the other commuters, there was plenty of room in the baggage car. I made my way to an empty seat and relaxed into the faux leather softness. As I thought about the differences, I noticed something about the station platform I had just stepped off of. The platform was built on two levels. The South end of the platform was about a foot higher than the North end. I’d never considered it before. Or if I had, it was simply to chaulk it up to making the platform more wheelchair friendly. Now, I realized why the baggage car was always at the North end of the train. It’s steps ended closer to the ground than the newer commuter cars. I wondered how many people, like me, were cramming themselves into the commuter cars while wondering about the “baggage” car? How often do we miss out on a better experience simply because we get stuck in our comfort zone? In this case, my comfort zone wasn’t even the most comfortable option. I now line up with the rest of the people to climb the steps and ride in the baggage car. It’s much more comfortable than the commuter cars.